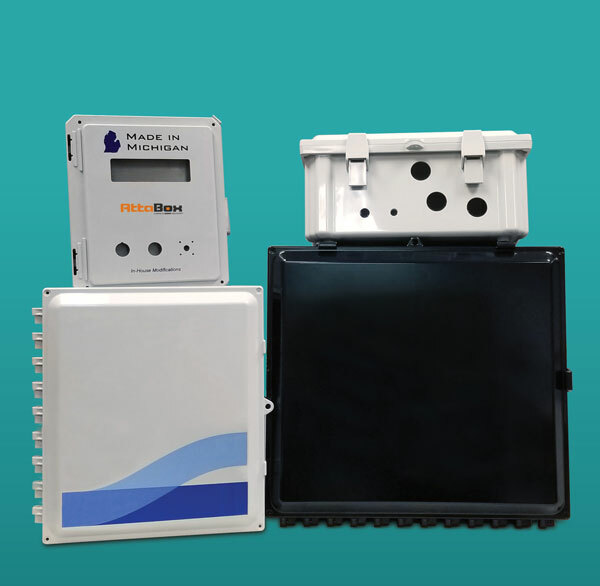 AttaBox™ Enclosures prides itself in its willingness and ability to meet the enclosure modification needs of customers. The combination of technologically advanced equipment and a sound procedure for handling the most detailed modification allows AttaBox™ Enclosures to process modifications on time, and to the highest quality standards in the industry. This AttaBox™ catalog is devoted to practical applications and solutions to enclosure problems. A variety of off-the-shelf products are available to solve common industry related problems. AttaBox’s ModRight Program is designed to support you in very uncommon or complex applications. When you need to pick up the phone for additional assistance, think AttaBox™ ModRight! a range of unique requirements from simple hole drilling to full custom blend of molding materials. The DesignRight Program will take your custom concept, perhaps your embossed logo or a completely custom cover design, and conform it to an existing enclosure. The result is your custom cover on a “standard” base. The FormRight Program is available for custom material formulation to match your unique requirements. AttaBox™ will work with you to custom formulate the sheet molding compound with the attributes that you require for UV, flame retardation, infestation resistance, you name it. The ProRight Program offers the capability of prototyping a unique design through the hand layup process or low volume molding. Product can be pre-tested for its effectiveness before large volumes of product are produced. The BuildRight Program offers a complete range of standard and unique modifications that make a useful configuration right out of the carton available. The BuildRight Program accommodates custom manufacturing and component assembly to deliver exactly the configuration that you desire at time of shipping. The CostRight Program will help you determine beforehand how cost effective the pre-assembly can be. Prices are agreed to up front at an industry competitive rate. The ShipRight Program evaluates current shipping requirements and offers “when-needed” and on time deliveries in an agreed upon manner. Bulk shipping and quantity requirements are considered under this program.